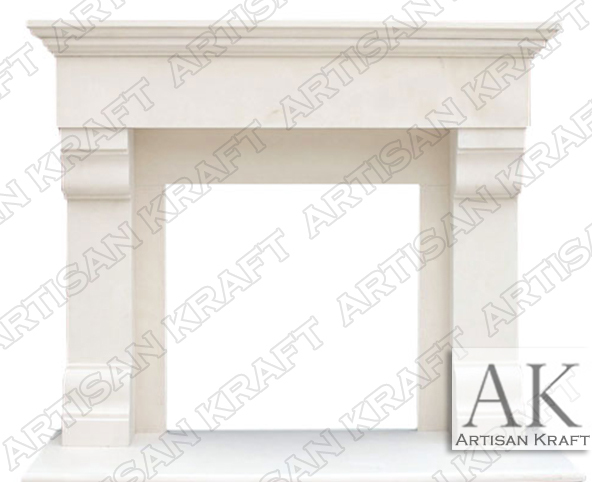 Traditional Winnetka fireplace mantel is pictured cut from limestone. This pristine transitional design with straight lines and steps allow it to be used in a variety of settings. If you have a home that requires a refined design then the Winnetka is your first choice. A simple step mantel shelf, two pilaster legs and hearth make this one of our most popular models. The Winnetka looks great in marble and cast stone as well. Everything is customizable with this model. Ordering it in cast stone will allow for a faster lead time. It is frequently stocked made from limestone, remember to visit the sale page. View this design in our Chicago mantel showroom. We will also be opening a Los Angeles and New York showroom as well. Stone: Limestone, travertine, precast, sandstone, marble.